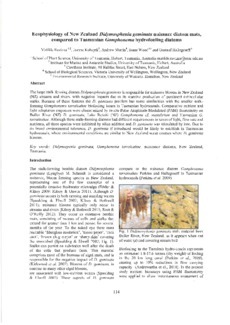 The large stalk-forming diatom Didymosphenia geminata is responsible for nuisance blooms in New Zealand (NZ) streams and rivers, with negative impacts due to its massive production of persistent extracellular stalks. Because of these features the D. geminata problem has some similarities with the smaller stalkforming Gomphonema tarraleahae biofouling issues in Tasmanian hydrocanals. Comparative nutrient and light adaptation responses were characterized by in-situ Pulse Amplitude Modulated (PAM) fluorometry on Buller River (NZ) D. geminata, Lake Rotoiti (NZ) Gomphonema cf. manubrium and Tasmanian G. tarraleahae. Although these stalk-forming diatoms had different requirements in terms of light, flow rate and nutrients, all three species were inhibited by silica addition and D. geminata was stimulated by iron. Due to its broad environmental tolerance, D. geminata if introduced would be likely to establish in Tasmanian hydrocanals, where environmental conditions are similar to New Zealand water courses where D. geminata blooms.